Is London leaving the country behind? This is a piece I wrote for Isis, the termly glossy published by OSPL – the same student-run company that owns Cherwell. It didn’t make the final cut, and I can see why. The North-South divide makes me think a lot, but I found it difficult to organise those thoughts around a distinct theme, and to make it fit with the material I was obliged to use – namely the interview with John Micklethwait, Editor of The Economist. I spent some considerable time on it however; so the final result is a good piece, an interesting one, but nothing spectacular. ‘All roads lead to London’ is not yet a quotation from Boris Johnson, a Classical Scholar, but it may as well be. Few cities can claim to be global centres of finance, business, art, politics and media. Despite intense competition from BRIC economies, London remains a leading global city – and its lead is growing. The city’s advantages – its language, timezone, legal system, and diverse cultural life – have propelled it to becoming the “capital of the world” suggests Christopher Meyer, a former British diplomat. Deals involving euros or dollars are made as often in the British capital as in Frankfurt or New York. “Every country in the world would kill to have a London,” says John Micklethwait, Editor of The Economist. He is surely right. Even taking into account recent dollops of public investment – CrossRail and the Olympic Games most recently – London is a national cash cow, contributing more in taxation to to national tax revenue than it withdraws. Oxford Economics estimates that the annual subsidy from London to the rest of the UK is £15-20 billion. Recognising this, the London Mayor is clamouring for greater fiscal autonomy: according to the LSE’s Tony Travers, Johnson is, Salmond-style, attempting “devo-max for the capital”. As things stand, London is institutionally embedded in the rest of the country, despite sharing ever less in common with it. Parliament and Whitehall have facilitated Scottish devolution, but it is difficult to imagine them doing the same for the capital. The problem is that institutions – seemingly fixed and implacable – cannot keep pace with the force of globalisation.Seismic economic change has made London less reliant on other parts of the UK; its interests lie in foreign markets rather than domestic ones. Consequently, financiers in Canary Wharf are more likely to visit Beijing than Birmingham. If they travel to Manchester, it is only to observe Chelsea play Manchester United from the safe confines of an executive box. Is the burgeoning inequity between London and the rest a price the UK should willingly pay? Back in 2006, when the Conservative opposition promised to “share the proceeds of growth”, David Cameron was fond of an analogy from Polly Toynbee’s book: Hard Work: Life in Low Pay Britain. She asked, if society is a caravan moving through the desert, even if all the members are moving forward, how far away do the ones at the back – the allegorical English regions – have to fall before there are two caravans, not one? Toynbee argues that it is far from evident that ‘a rising tide lifts all boats’. During the last boom, although the South-East grew faster than the North, the frothy bubble of consumer credit and public spending gave the impression that debt-fuelled prosperity was a national, not London-based, phenomenon. Property in particular was a lucrative market for northern investors: city-centres across the North were redevelopmed and gentrified. But in reality, London’s size has made it difficult for regional businesses to grow. Budding companies from outside London are in a permanent Catch-22. If they succeed then re-locating to London is a necessary step to further expansion abroad. If they struggle, then larger firms or private equity outfits from the capital are likely to swallow them up. When the FTSE 100 began in 1984, only half of its listed companies were based within Greater London; today the figure is over 70%. This means that professional services – accountancy, consultancy, law – are also concentrated in the capital. When times are good, these changes go unnoticed. Jobs remain plentiful, even if the more lucrative ones are no longer available at home. But in bad times, educated graduates escape the regions to head for London – and when growth resumes, they do not go back. 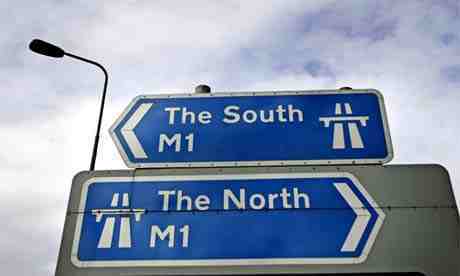 In 2012 over half of graduate jobs were in the South-East; the result is a slow brain drain down the M6. Is there a solution? The Coalition Government is committed to building a high-speed rail service (HS2) extending to Manchester by 2033; this mammoth expenditure represents the centrepiece of its regional growth strategy. HS2 is designed to channel investment up the county, shrinking the distance between North and South, but who is to say that investment won’t go the other way? Manchester itself might hold the answer. Since the early 90s, the city has created a distinct identity and an integrated economic strategy. The University of Manchester has doubled in size in less than a decade – two of its scientists last year won the Nobel Prize for Physics. New developments such as MediaCity[VB4] , now home to several divisions of the BBC and ITN, promise to create the clusters of high-value activity that London currently monopolises. The city has taken stock of its major assets and sought to build on them: the area around Manchester Airport, the third busiest airport in the UK, has been designated an enterprise zone. The MetroLink – a hitherto inadequate tram system – has been extended to connect Salford Quays, the new home of the BBC and Granada Television, to an increasingly vibrant city centre. But it won’t be enough. Government austerity has seen the number of public-private partnerships – of the sort that helped regenerate central Manchester after the 1996 IRA bomb – plummet. Private sector retrenchment has curtailed new development and investments. “One of the curiosities of British politics… is how little the dominance of London shapes the politics of the English regions,” says Douglas Fraser, the BBC’s Scotland editor. It may yet do so. Birmingham in the late nineteenth century, with Joseph Chamberlain as Mayor, famously embarked on a heroic program of town planning and great public works. Similarly a walk along the neoclassical terraces of Grey Street in Newcastle, or an evening with the Halle Orchestra – the world’s oldest – in Manchester should remind us that municipal pride and endeavor weren’t always unique to our flourishing capital. For these peripheries to reassert themselves they must embrace charismatic characters that personify this pride. However, attempts to introduce elected mayors in England’s major cities were overwhelmingly voted down in May. This should cause great remorse. Big personality mayors would have electrified a Northern political consciousness that has for too long been stagnant. When Alex Salmond, the Scottish First Minister, speaks up for Edinburgh and Boris Johnson boisterously fights London’s corner, the North suffers. There is no name synonymous with the great cities of Manchester, Leeds or Newcastle. The North’s clout in the media is meagre. Strong regional titles such as the Manchester Evening News, the Guardian and the Daily Herald used to keep a finger on the northern political pulse; all are now defunct, emasculated or based in London. For the time being, the English regions – lacking a distinct competitive advantage or identity, will continue to serve as the hinterland of Britain’s global city.